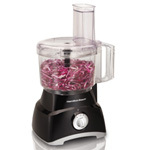 If you chop, slice, shred, grate, or puree often when cooking, then a food processor is a valuable appliance for you. These versatile machines make these repetitive time-consuming tasks much easier and faster, but finding the best food processor for your needs can be tricky. There are dozens of different models from several manufacturers ranging in price from around $40 to over $400. Some of the important things to look for when purchasing a food processor include the size of the feed chute, the capacity of the unit, how well it performs each task like chopping and grating, how loud the machine is, the size of space it will take on your counter, and additional attachments like a dough blade. 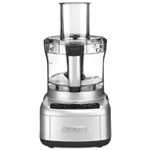 Below you will find our reviews of the top 10 best food processors. 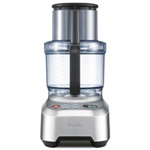 If you need more help or info see our Food Processor Buying Guide. 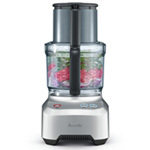 Our choice for the best food processor is the Breville BFP800XL Sous Chef. It is also the highest rated model on Amazon, although it is also the most expensive on on our list at about $400. Its 16 cup capacity – the most on our list, wide feed chute and 1200 watt motor can handle almost anything thrown at it. About the only weakness we could find is in kneading dough. In testing it was as good or superior to every other model on this list at chopping, slicing, shredding, pureeing, and grating. Overall we highly recommend this Breville model for all users, but for occasional users or more budget conscious consumers there are cheaper options available. Buyers should also be aware that the Breville BFP800XL is a large appliance and will take up a lot of space compared to some of the more compact models on our list. 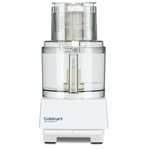 The $269 Cuisinart FP-14DCN improves upon the popular and amazing Cuisinart DFP-14BCN. The FP-14DCN combines a larger 14 cup bowl with a smaller 4.5 cup work bowl nested inside to allow for any batch sizes. Meanwhile the 1300 watt peak motor provides more than enough power to handle any task you throw at it – whether you pureeing, slicing, chopping, or shredding. It is also pretty decent at kneading dough. The one thing buyers should pay attention to is the size of this appliance to make sure you have room for it. Weighing 20 pounds and with dimensions of 7.8 x 10.2 x 17 inches it is one of the largest food processors on our list and takes up a lot of space. As long as you have space for it, we are sure you won’t be disappointed in the Cuisinart FP-14DCN’s performance. The $300 Breville Sous Chef BFP660SIL is a cheaper and more compact option over the BFP800XL. Despite the smaller size and price, you won’t notice much of a drop off in terms of performance. It has a little bit less capacity at 12 cups and comes with a 1000 watt motor that is still plenty powerful. The BFO660SIL is very thoughtfully designed and it just works easily and efficiently. Some other features include a 5-inch wide feed chute and 30 different slicing widths. We would recommend the Breville Sous Chef BFP660SIL to all users except those who want the absolute best or who do not want to spend almost $300 on a food processor. Our pick for the best food processor under $200 is the $199 Cuisinart FP-12N. Although be aware that price is for a white or black model – a brushed chrome model costs $249. 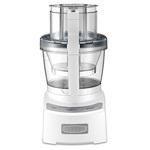 We really like the FP-12N because it is one of, if not the quietest food processor you can buy. The performance is not quite up to par with the top two choices on this list, but with its 1000 watt peak motor it is comparable to the Breville BFP660SIL. It comes with a 4 cup bowl, a 12 cup bowl, an adjustable slicing disc, adjustable shredding disc, large and small chopping/mixing blades, and a dough blade. There are few minor complaints about the Cuisinart FP-12N from users. The machine can be turned on despite the lid not being locked down, so you can make a mess if you don’t absolutely get it locked down all around. It also is hard to clean the gasket in the top and food can get stuck there. However, these inconveniences don’t really detract too much from an otherwise excellent appliance. 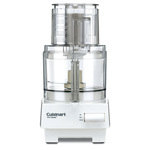 The Cuisinart DLC-8SY is a solid 11 cup capacity food processor that is available for about $170. While it can still handle all the tasks like chopping shredding, pureeing, slicing, and kneading, the 625 watt motor is a definite step down from the other top performers on this list and you would notice the difference. It comes with a chopping/mixing/kneading blade, a 2mm slicing disc, a 4mm slicing disc, and a shredding disc. Overall the Cuisinart DLC-8SY is very simple to use and the wide feed tube is a nice feature. The performance does not match more expensive models, but for occasional users it will still perform well enough for you. 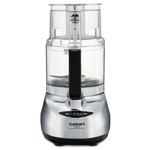 Priced at $149, our choice for the best food processor under $150 is the Cuisinart Prep Plus DLC-2009CHB which is a 9 cup version. It is a good value buy because of its cost and at this size it is perfect for anyone preparing small meals while taking up less room on your countertop with dimensions of 9.5 x 7 x 13 inches. With a 600 watt motor It also handles all tasks quite well, except for chopping which we would describe as only average. Overall we would recommend the Cuisinart Prep Plus DLC-2009CHB for all users except those who want a larger or more powerful model. The $115 Cuisinart Pro Classic DLC-10S is the next step down in size and performance for Cuisinart models with a 7-cup capacity. It comes with a stainless steel chopping blade, medium slicing disc (4mm), and shredding disc. The overall performance is OK, but not great. The accessories are a bit lacking on the Pro Classic DLC-10S, but for basic chopping and shredding it gets the job done. 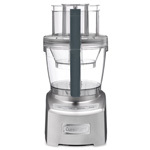 Our pick for the best food processor under $100 is the $97 Cuisinart Elemental FP-8SV. This compact model has an 8 cup capacity bowl and comes with reversible shredding and slicing discs. It can handle most tasks, but with a 350 watt motor it can struggle with some things. One downside is that the Elemental FP-8SV is a bit harder to clean than some other models because the center post does not come apart, but you still need to clean that part of the machine. The best selling food processor on Amazon and the cheapest food processor on our list is the Hamilton Beach 70740 which sells for $32.99. 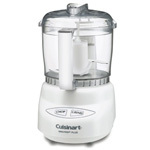 This 8-cup capacity unit comes with a 450 watt motor, stainless steel shred/slice disc, and a chopping/s-blade. It also has 2 speeds plus a pulse control and a wide feed chute to give you more control over your food prep. Overall the Hamilton Beach 70740 works surprisingly well for the price, but does not compare in overall performance or versatility of some of the top-tier models. Therefore we recommend the 70740 for those users who are on a budget and cost is their biggest concern. The DLC-2A Mini Prep Plus only has a 3 cup capacity and a 250 watt motor, but it also only costs about $40 and comes in a huge variety of colors. It excels at blending even textures and emulsifications. For small food prep or chopping jobs we really like this model, especially if you already have a larger model but don’t want to set it up just to chop onion. However, the capacity and power of the DLC-2A Mini Prep Plus really limits its applications. If you make a lot of homemade dips or salsas and do a lot of chopping, slicing, shredding, mincing, or grating then we highly recommend getting a food processor. A lot of people ask if they really need one or can they just use a blender. The answer in the vast majority of situations is no, with the biggest difference being that blenders need some liquid to work properly and food processors are designed to work on solid or liquid ingredients. Capacity – Listed dry capacities range greatly from less than 5 cups up to and over 20 cups. For the most versatility we recommend a large capacity of at least 9 cups with 11-14 cups being preferred. Remember that if you are processing liquid food products then the capacity is about one half of the listed dry capacity. If you know you will only be processing small quantities then you can get away with a smaller capacity unit. Some models also have a smaller bowl that fits inside of the main container. Feed Chute – Look for a wide feed tube to handle larger foods like potatoes or cucumbers. Power & Speeds – Power is measured in watts, but that combined with the motor efficiency determine overall power of the machine. In general the higher wattage the better. Most models come with 1 or 2 speeds and a pulse button which pauses the machine for a brief moment to handle certain tasks better. Uses & Attachments – Most models come with different blades to handle each task – chopping, slicing, shredding, mixing, and kneading. You want to make sure the appliance you are looking at can handle each task you will use it for since some do not have a kneading blade for making dough. We recommend looking at user reviews of each product to see how they perform in each area. Cleaning – You want a model that is easy to take apart and clean and that has dishwasher safe parts. Noise – Many machines are really noisy, so a quieter model usually will cost more, but they are available.